great pillow for the price...I buy these for staging homes and it helps to have them shipped directly...who wants to lug pillows?? :) Think they would be great for most anyone...you should always replace your pillow regularly anyway!! Rest your head down on this comfortably and plush anti-microbial pillow. This pillow is is treated with Ultrafresh to inhibit bacteria growth and reduce mites. It can assist with asthma and allergy control and features a hypoallergenic polyester fill and a soft 240 thread count cotton cover. I purchased these pillows after having tried other pillows that were a disappointment. These pillows are GREAT!!!!!!!!!! I would tell anyone who is hesitant to go ahead and get them. They keep their shape and are so comfortable to sleep on. I bought these pillows after seeing a blog article about how to tell if your pillows are too old or not (if you fold them in half and they don't open back up by themselves then they need to be replaced). Mine were ancient! I bought these hoping they would help with my bedtime asthma and they made a huge difference! I used to have an asthma attack nearly every night when getting into bed but after getting these pillows (and putting a cover over the mattress and washing all the bedding in very hot water) my nightly asthma attacks all but disappeared. They are so soft and comfy while providing plenty of support. I plan to get more for the guest room. I ordered the allergy free anti-microbial pillows set of 4, personally, its a good pillow and I would recommend this to family and friends. I wasnt sure how buying a pillow on-line would work out, as I usually have to feel the pillow to make sure of the firmness. I must say I took a chance and ordered these pillows and "Love them". Super soft to the touch and feels great on my neck. I sleep both on my back and side and these pillows work great for both positions. Was a great price for the set also. I will probably get more for the spare bedrooms as well. Would highly recommend. Also, I have dust allergies so these pillows are treated ,but you can not smell the "Ultra Fresh" scent. Not the best but definitely not the worst either. They come fluffy and mine has kept quite a bit of it's fluff, but my husband's, who really squashes his pillows, is noticeably flatter - when you sleep on it. But he likes it that way. There are better pillows out there, and I have slept on them - not sure how to find them to buy them, but we have gone through several sets of pillows and these have kept their fluff for way longer than most that we have had. (Thinking about it, we always buy cheap pillows) We have had them for several months(4) and have noticed no discoloration, and no head-like smells. We are keeping 2 aside for guests and since we don't get months worth of guests they should remain "good as new" for a long, long time. Just looking at the "like new" and the used pillows side by side, the used pillows are about half as fluffy. I have dust mite allergies and bought these new pillows along with allergy pillow protectors. I have been using for 2 weeks now and love them. I think they are helping my allergies. Pillows so far have kept their fluff. I'll see with time if they last but for the price they are worth it! I was worried that the pillow would have a noticable scent but I haven't noticed any scent at all. I would recommend these and in the future will be buying more for other beds in my house. Great pillows with a great price! I have been using these pillows for about a month now, they are comfy and nice to sleep on. For my Husband they are not firm enough. I really liked the idea of allergy free and anti microbial. I have noticed that I am sleeping better. I was concerned about the flatness when they arrived but they puffed right up with a little fluffing. They may not be as great as down pillows but they are very comfortable, allergy-free and you can't beat the price. They remind me of the pillows found in high-end hotels. I guess I'm not very good at buying pillows. I've always had really nice soft feather pillows that held their shape and felt wonderful. I thought I would try these cause of the other reviews I saw. These pillows are horrible. They're small. They lost their shape after just a week of gentle sleep. They might work for a toddler. I'm very disappointed and I wasted ***. Love to find allergy free anti microbial pillows for a reasonable price. 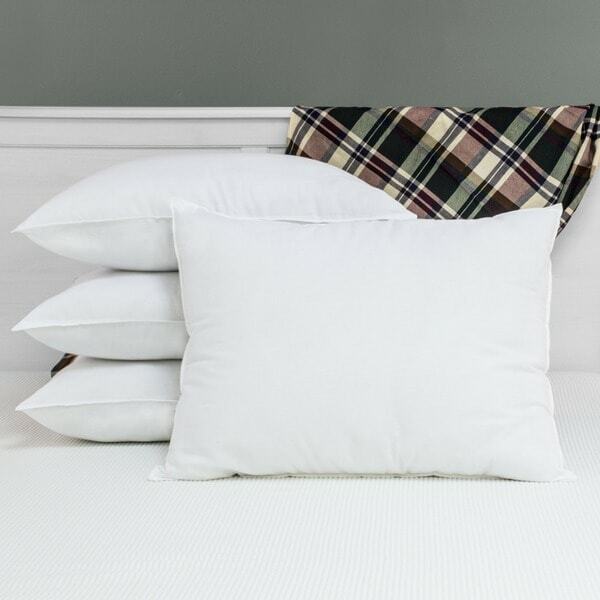 These standard size fit perfect for standard size pillow cases. I highly recommend. OK I guess for the price but really soft & flimsy. They ended up being tossed in a closet to be used as spares. Not as soft as was described in reviews, but fairly soft. I was used to down very soft pillows, but due to discovery of my son's allery to down I had to dispose of all the down in my house. These pillows were fine for me; I use two of them to lift my head while sleeping (for GERD). My husband thought they were too soft for his taste. I like the fact that they go back to original form easily even if they get folded while sleeping. They have a different "feel" from regular pillows as they feel very soft at first, but once you get used to it, it has as much push-back as a regular pillow. comfortable from the start. washable on hot. good purchase. Does what it's supposed to do with a good price. Very basic pillow. Good for extras. Not luxurious. I have allergies and chronic bronchitis. So I change pillows frequently. These are perfect for me! They are exactly the density I like, non-alergenic, and inexpensive for the quality. Thus I do not feel guilty about replacing when they are a few months old. Great pillows for the price.These pillows are wonderful for guest rooms. Would buy again. Too fluffy for my liking! These pillows are wonderful ! These pillows are very nice. I bought them specifically for putting in shams, but I will certainly have no qualms about using them for guests and sleepovers. This were perfect for decorative pillows. They are not quite firm enough for my sleeping preference. These pillows are nice and soft, the conform to you head and neck. They do not cause any allergic reactions to the down feathers. I would not hesitate to buy there again. Hello anniewingo, These pillows are designed for spot clean only. I hope this helps, thanks for shopping with us. I wouldnt wash them there wouldnt be anything left. If they are spot clean only then why does description say that they are machine washable and durable? Hello ceecee17, These pillows are manufactured in the US. Thank you for shopping with us.